The real investment you make in Recipe Software is not the purchase price, but rather, the time you spend organizing your treasured family recipes. Consequently, Recipe Software is only as good as the company supporting it. That’s why it is important to choose high quality Recipe Software from a reputable company that is committed to ensuring customer satisfaction. Cook'n is the best Recipe Organizer money can buy. We have been selling Cook'n for 26 years and have over 6 Million satisfied customers. Our technical support staff is amazing and ours is the only company that offers a wide selection of brand-name cookbooks for less than the printed books in the store. We provide a free monthly newsletter and a Forum where you can communicate with other Cook'n users to post questions, share recipes, and get answers. We offer helpful accessories like decorative, printer-ready recipe cards and binders so you can make your own family cookbook! 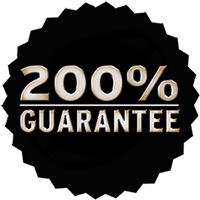 Risk-Free 200% Guarantee Means You Can't Lose! If you are not completely satisfied with the quality of your Cook'n Software, I will refund your purchase! In fact, I will go one step further and buy you the recipe software product of your choice. So, order today and join the Cook'n Family! NOTE: With regard to subscriptions...If you cancel within three days of purchasing an Annual subscription, the cancellation takes effect immediately and you receive a full refund. If you cancel more than three days after purchasing the subscription, your subscription continues until the end of the subscription term, but does not renew. We don't offer refunds for monthly plans.